A salami in every family. 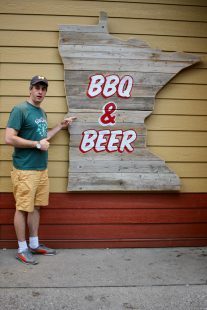 Apparently, the Twin Cities are about more than just Jucy Lucys. And while some may question that, Black Sheep in St. Paul gives reason to believe in life beyond cheese-stuffed burgers. 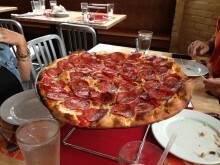 A coal-fired pizza place, Black Sheep still relies on cheese, but in quite a different manner. Walking in to the below-ground-level spot, I was immediately inundated with the scent of garlic, a smell that signaled good things ahead, as well as a scent that would remain with me for the rest of the day. Is this what I was thinking? 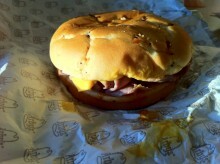 Arby’s has always been kind of a fringe fast food chain. You can find it all over the country, but it isn’t exactly on every corner. Perhaps this is the reason it has taken me so long to review them. Or perhaps the reason is because I once heard their meat begins its life as a liquid. Whatever the case, a golden opportunity to chow down on some potentially formerly liquid meat presented itself at the Minneapolis-St. Paul Airport. Before leaving the Northwoods, I made a stop at the Mall of America in Bloomington, Minnesota to eat at Crave. Although the Mall of America can hardly be considered part of the Northwoods, it’s close enough to be included in my weekly special. 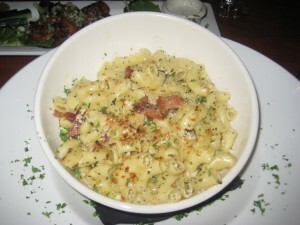 Crave was a nice and spacious restaurant that came highly recommended by my family that was taking me there. A whole lot of food on the menu looked great and we started by ordering appetizers. We got the Mini-Burgers, which the menu said came with bacon, cheddar and rosemary. We also ordered the Lemon Garlic Wings, which came with “Amablu cheese dressing” and cucumbers. Since the family likes cucumbers, I didn’t order the dish without them and just hoped they didn’t touch any of the wings I wanted to eat. Fully devoid of any vegetables. Stuck in the Minneapolis/St. Paul airport on a layover, I set out to find some good food to eat. This isn’t exactly an easy task, especially considering that I had a very limited amount of time to eat and had to resort to fast food. 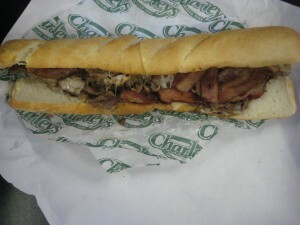 I found Charley’s Grilled Subs and decided to try it out. The had a grill where you could actually see what was being cooked, plus the prices weren’t out of control. I quick glance at the menu revealed to me what I needed to eat, the Bacon 3 Cheese Steak, three of my favorite foods in one sandwich. They actually had a pretty efficient system set up, where the guy grilling asked you your order before you made it to the cashier, so it could be prepared ahead of time. I guess when you’re eating in an airport, you notice these things.